Hello there, today we are celebrating the launch of the new Wintertime Fun catalogue from Hero Arts. It is filled with wonderful new winter and Christmas products but lots of them can be used all year round too, as you will see in one of my cards below. The new products are available to purchase from the Hero Arts Shop now. If you are following along with the hop, you should have arrived here from my amazing teamie Amy. If you get lost along the way, I have the full list of participants below. For my cards today, I wanted to create a Christmas card and a non-seasonal card. My first card uses lots of new products from the catalogue. I started off by taking a piece of Bristol paper and cutting this using one of the Rectangle Infinity Dies. I took various shades of Distress Ink (colours listed below) and blended these over the piece. I then took the tree images from the new Winter Silhouettes set and stamped these on top with Intense Black ink. I then splattered over some Copic Opaque White. On a separate piece of cardstock, I took the reindeer from the Jingle All The Way Stamp & Cut and stamped this with Intsense Black Ink, coloured it with Copic Markers and then used the matching die to cut him out. He was added to the background piece with foam tape. I took one of the sentiments from the new Off-Beat Holiday Messages set and stamped this on to a piece of black cardstock with Versamark ink. I applied white embossing powder, heat set and then cut in to a strip. This was also added to the panel with foam tape. I took the Snowflake Confetti die and embossed this on to the front of an A2 white card base. I then added the image panel on top with foam tape. To finish off, I added two sequins from the new Frosty Sequin Mix plus a few gems. I also added Tonic Nuvo Crystal Glaze to the bells on the reindeer's collar. COPIC MARKERS: E59, E57, E55, E53, R00, R89, R37, R29, R27, R14. My next card uses the new Seal Family wood mounted stamp. There are lots of animal family stamps in this catalogue and I thought it would be fun to use the seal one for a baby card. I started off by taking a piece of Yupo paper and applying TH Alcohol Inks to it. I wanted an ombre look so I used Sailboat Blue at the bottom, followed by Turquoise in the middle and Aqua at the top. I loved how it came out! I added this piece to a white A2 card base and then added white cardstock strips to the sides with foam tape. I took the Seal Family stamp and inked this up with Intense Black Ink and stamped it on to a piece of white cardstock. I coloured the seals with Copic Markers and then fussy cut them out with scissors. Once cut out, I added black pen to the edges to neaten them up. They were added to the card with foam tape and tape runner. I took the 'new baby' sentiment from the Congrats Stamp & Cut and stamped this on to a piece of black cardstock with Versamark Ink. I applied white embossing powder, heat set and cut this in to a strip. This was also added to the card with foam tape. To finish off, I added dots of Tonic Nuvo Jewel Drops. COPIC MARKERS: W7, W4, W2, W0, R000. 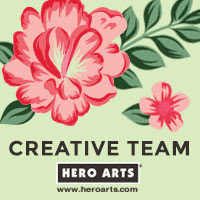 Hero Arts are giving away three $25 shopping sprees to three lucky winners. The winners will be drawn from comments left across all of the blogs in the hop. Please leave a comment by Wednesday 30th August at 23.59 (PT). Hero Arts will announce the winners over on the Hero blog the following week. As you can see the next in the hop is the amazing May. Thanks so much for visiting me today. I hope you have a great day! That facial expression on that reindeer's face always makes me smile...such a cute card Michelle. Love your Seal family card, so SWEET! Gorgeous coloring! Love the reindeer card, such a sweet face and the card is a beautiful design. And the baby card is precious. Both cards are stunning! Love them! Perfect! Beautiful cards!! I love the ink blending. Looks perfect. The background embossing is so pretty. The baby card is adorable! Now that is one proud raindeer. Thanks for sharing. I love the background you achieved with that reindeer card. Just lovely! I love the way your water turned out on the seal card. Your cards are wonderful. Love that deer...so proud and the seal family...adorable! Great cards, love the seals! Adorable cards :) So cute! Both cards are just too cute!! Your reindeer is my favorite card on the hop this morning...simply adorable! Love your background on the reindeer card! The seals are adorable too! Your snowy background is beautiful and I love the idea of the animal family stamp for new baby cards! Just heard that grandbaby number 10 is on the way so my favorite is that seal family! How sweet!! Love your coloring too. Thanks for sharing these two special cards. Awe - the little seal family is so cute! <3 that card! Love your Rudolph!! He's so happy. Love these cards! The reindeer is beyond cute! I love how you incorporated the animals for all the animal lovers! Something different from cats and dogs! Michelle the way you used the alcohol inks on Yupo paper was lovely. I have never tried this and was wondering how my copies would work on Yupo paper? Thank you! 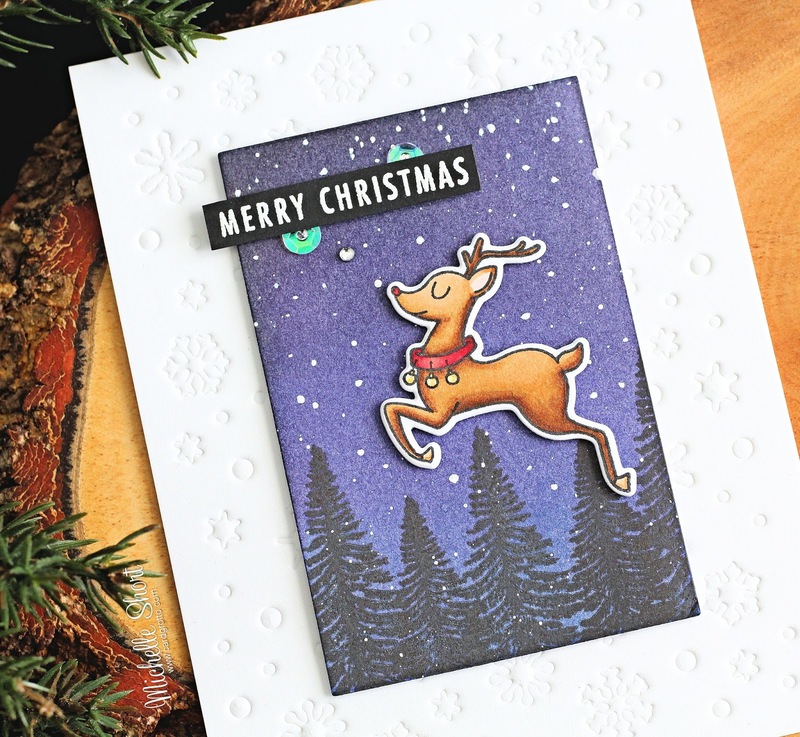 Love that cute reindeer on such a serene and elegant background - and the added embossing on the white card stock is perfect! And that new baby card is seriously the cutest and prettiest ever. Thanks so much for sharing! That is some confident reindeer, love this card! Love both of your cards, Michelle! You make the most beautiful backgrounds! Both cards are super cute for Christmas. Rudolph looks so happy flying through the sky, love your backgrounds. That is the sweetest reindeer, but the seal family has stolen my heart! LOVE!! Simply gorgeous! I am loving all the new goodies! Beautiful color combinations, Michelle! I like the texture on the Christmas card and the sweetness of the Seal family. The reindeer card is so cute. The reindeer card makes me smile! Love your cards. Very cute designs Michelle. Love the colours you used. Rudolph is definitly ready to fly ... love it! Love the leaping reindeer and embossed background, and those otters are adorable!!! Love, love, love both of your cards! That reindeer is so cute! And those seals - the are the cutest! So cute for a baby card! Thanks for sharing your cards with us! Both the cards are beautiful. I like the seal family more... It's SO CUTE! OH I love that night time tree silhouette! Michelle your cards are so sweet! Two lovely cards! The reindeer flying over the trees is so fun and the Seal Family card is precious! Such pretty works...I especially love your reindeer card. That reindeer is just so much fun, and the embossing is subtle but effective. I don't dare look at the catalog--as a 25 year labor and delivery nurse, I am a sucker for any mother/baby image! Thanks so much. Your coloring is spectacular! Those seals are SO cute! The reindeer card is so cute, but I must say, I don't remember when I've seen a better stamp set to use for announcing or congratulating the arrival of a new baby. Just adorable & so is your card. The seals are so sweet and the look on the reindeer's face is priceless! Great cards, I love your creativity! 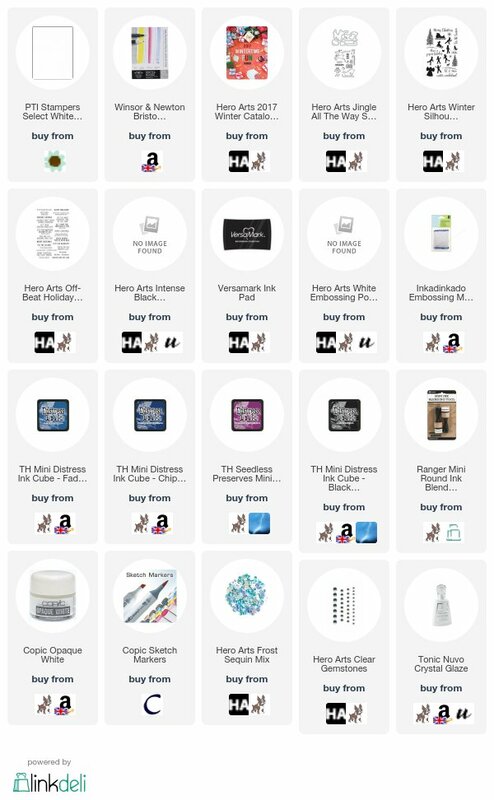 Thanks for sharing your wonderful creations on this fun blog hop!! I love both cards. They're so sweet. Beautiful cards! I really love the animals from Hero Arts. These are such cute cards. both of your cards are wonderful. I love the seals. 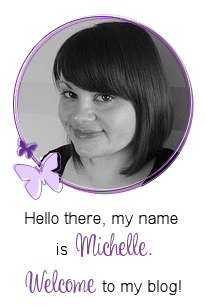 Michelle, your cards are beyond adorable and so beautifully pulled together!!! Love your cards the seal family is so darling the card you made is perfect. Great cards. The reindeer looks quite content, but the seals are just too cute. Both of these are so cute. I really like the embossing of the snowflake confetti. Thank you for sharing. Love. love, love the new baby card. You do such great work. Love the night sky with the regal Rudolph prancing across the card. Thank you for sharing. Both cards are adorable, but the face on that little deer is just so so cute. Great job. Such sweet cards! I am really loving these images! Beautiful cards once again, Michelle! It is always such a pleasure to see you create your cards. I really like the background "night" sky of the first card! Great backgrounds for these cute images. That deer card is awesome. As always, beautiful creations !! WOW! You cut out that gorgeous seal family by hand!? Beautiful job on that seal card--and using Yupo with alcohol inks. The deer card is so whimsical, it brings a smile to my face. Love your cards! From the smug little reindeer to the sublime seal family! So Cute! Like the cute leaping reindeer & the cute seal family. What cute cards, love them both and what a great baby card. Thanks for sharing your inspiration. LOVE your Seal Family card especially, the background on YUPO paper with alcohol inks in shades of blues! Great work of Art! Well done! I agree these are beautiful and I love the reindeer he is so cute but the rest are awesome too. Great creativity. I agree all your cards are awesome. I love the reindeer he is so cute. Great cards! Love the reindeer! Very beautiful cards. The background is stunning on the dear card. Beautiful cards. The reindeer is so cute! 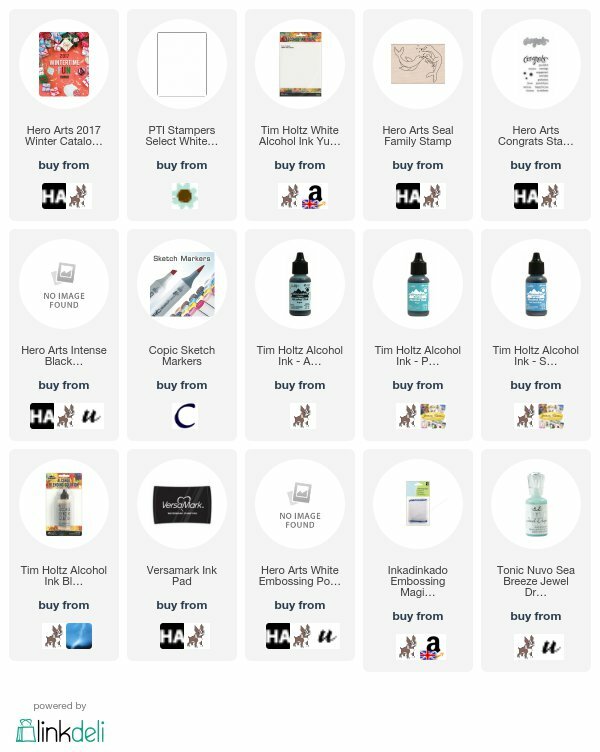 Is the giveaway open to uk residents please? Yes, it is open worldwide :) Your comment will be registered. Thank you! Beautiful, bring on the holidays! The deer card is so cute. Both cards are fabulous! The Reindeer card is so adorable. I love the seal card it looks as if they really are swimming. Great job and thanks for sharing. I love both cards, but the Seals are my favourite, I've just bought some Yupo to try it, can't wait to try it now I've seen your lovely work! The purple night sky looks so pretty and love the happy reindeer. And gosh, the yupo paper background is so pretty! I love that impish expression on the reindeer's face, you captured it beautifully in your coloring and your use this great creature on your first card. Love the scenery you created as well, a wonderful card--both cards are lovely! Enjoyed seeing your cards. I love the night sky you created in the reindeer card. Both cards are wonderful - but that sassy little reindeer is just too cute for words! Wow...just fabulous! Love that sweet reindeer and those seals are as cute as can be. oh love these cute cards! Those seals are adorable and love the water background you did. And the face on that reindeer! OMG Michelle, that background panel on the seals card truly looks like 'real water'!!! I am interested in learning about alcohol inks and can't wait for Monday's tutorial. Awesome creations Michelle, truly!!! Both cards are absolutely fabulous! So cute. Love that little seal family!!!! Oh my goodness. These cards are adorable! Such cute cards. Love them both. I love the high flying reindeer on the first card.The seal family is so sweet. Your cards are beautiful and I really enjoy seeing how you ink and color the backgrounds. Love your cards! Thanks so much for sharing! What a silly smirk on the reindeer's face. Both cards, too cute! Great set of cards, and I love the alcohol ink backgrounds. Fantastic cards! I would love to see a video with the Yupo paper, it's facinating to me. These are both so fun. Love your backgrounds. Thanks so much. 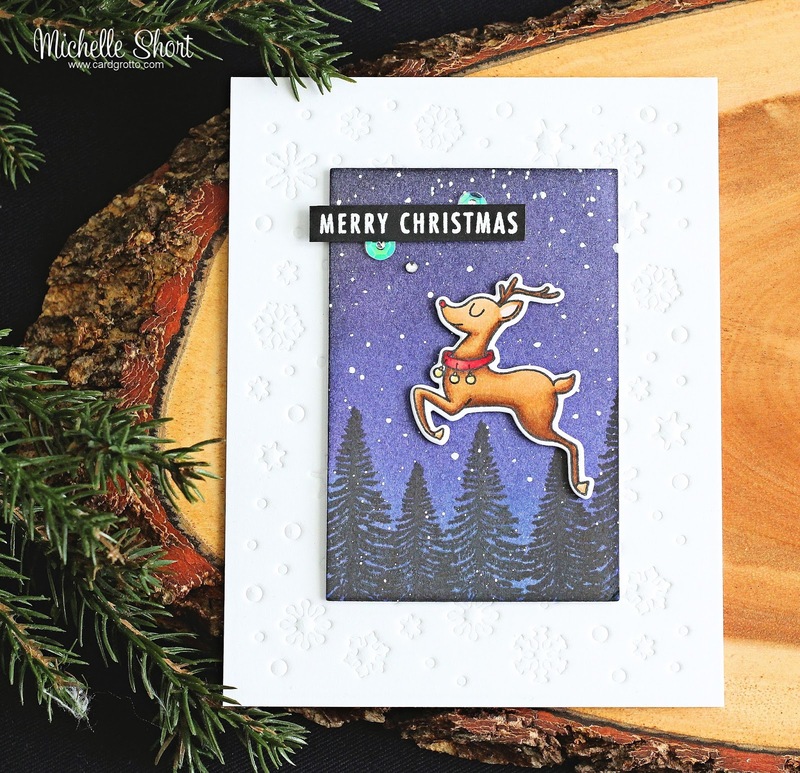 Your first card is just wonderful with the inked background behind the cute reindeer. Your 2nd card is just so sweet and beautiful. Such great inspiration! Two absolutely adorable cards! The background on the reindeer card is fabulous! And those seals are just too cute! Cute little Rudolph flying over the trees on Christmas Eve! He is so proud of himself and rightly so. Ahhhh, my wish list keeps getting longer..LOL! I adore your seal card! The blues in the background are amazing, the seals are super-cute, and the clear nuvo drops are a perfect, bubble-looking detail. Both cards are wonderful! The funny reindeer makes a great contrast to the more serious background and the baby card is super cute! Love these cards! Rudolph is great, setting the scene with the trees stamp...ingenious! The baby seal card would bring a smile to any new parents' face. Love it. Love your reindeer card! Great background! Great designs. Lovely cards. Great colors. Hero Arts is having a great holiday release. The seal family is adorable. The water behind them is great. OMG-the seal card is just amazing. This release has a lot of good stuff! 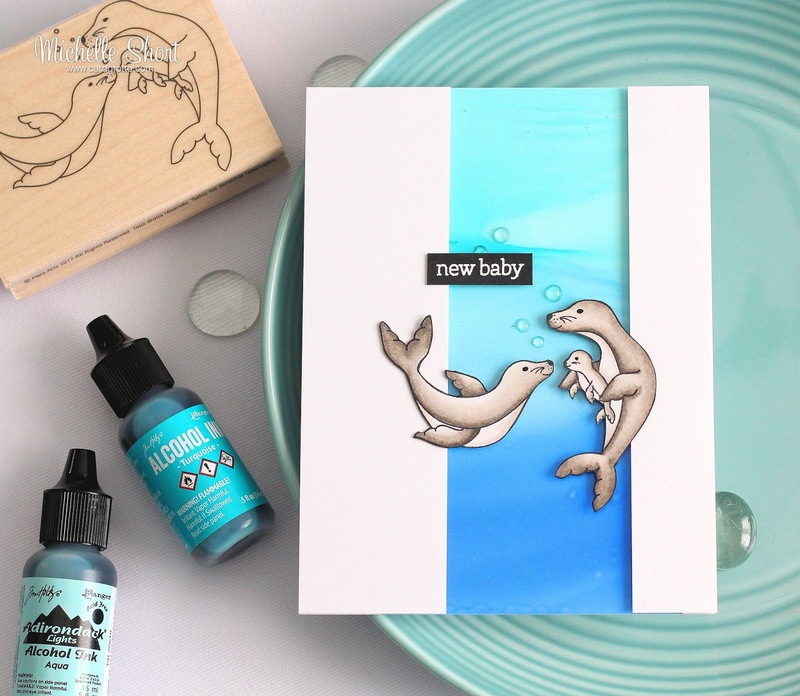 such cute cards - the seal family baby card is absolutely adorable!! Love the night scene of the first card and the cute baby seal of the second card. The seal family is so cute and adorable. Love both your cards. The seal card is just adorable! Gorgeous, especially the seal card, who can resist that adorable stamp? I love these cards, I'm such a fan girl of your work! These are so cute! I love your little reindeer scene! oh the card with the little Rudolph is just too cute!! love the clean, crisp design of the second card! Wow! I've pinned both of these cards. I can't stop admiring your beautiful backgrounds. That blue on the seal card is fabulous! Thanks so much for the inspiration. Oh the reindeer - and the seals! Love them both!!! These are such adorable stamps and dies! Love both of these cards. Thanks so much for sharing. Classic Christmas card, cute reindeer. Just love the new baby seal card. The reindeer card is so cute and the baby seal card would make a great baby congratulations card. Thanks for the inspiration. Very cute cards! I love the embossed snowflakes! Darling cards!! Just love that winter background in your first! Thanks for the inspiration! 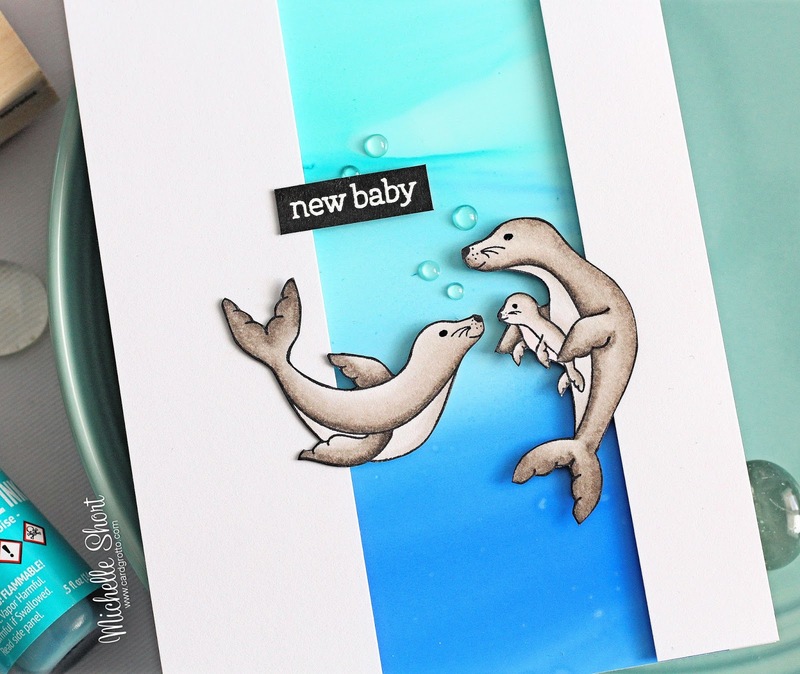 Beautiful cards, I love the seals and the not so traditional baby card. Such cute cards! That little reindeer jumping looks great over that night sky!